The U.S. military relationship with Latin America is evolving rapidly, as the "war on terror" replaces the cold war and the "war on drugs" as the guiding mission for Washington's assistance programs in the region. Though U.S. attention is fixed on other parts of the world, the scope of military aid is steadily increasing in our own hemisphere. The upward trend owes little to post-September 11 initiatives to protect the homeland from international terrorist organizations. Instead, much of the increase comes from ongoing Colombia, counternarcotics and military-training programs that largely resemble the military assistance the United States has offered for decades. The number of Latin American personnel trained by the United States increased by more than 50% from 2002 to 2003. Almost all of the increase comes from a sharp rise in Colombian trainees as Plan Colombia becomes fully operational and evolves into a larger counterinsurgent effort. The United States continues to encourage military practices, programs and doctrine that promote a confusion of civilian and military roles, especially the creation of new military missions within countries' own borders. This trend raises an increasingly urgent question: What happened to the line between civilian and military roles? This is not an academic question. It goes to the heart of democracy -- which includes a clear division between the civilian and military spheres. In most functioning democracies, the military -- which makes decisions through a top-down, hierarchical structure -- focuses on external security and leaves politics and development to elected civilians. Blurring this distinction -- for instance, by having the military carry out crimefighting or other roles that civilians can fill -- risks politicizing the armed forces, which in turn leads the military to use (or threaten to use) its monopoly of arms whenever it disagrees with the civilian consensus. Utilizing the armed forces in police roles can lead to excessive use of force. Too often in Latin America, when armies have focused on an internal enemy, the definition of enemies has included political opponents of the regime in power, even those working within the political system such as activists, independent journalists, labor organizers, or opposition political-party leaders. Traditional civilian-military roles are being blurred not only overseas, through programs for Latin American militaries, but here at home, in the formation of foreign policy. Resources and responsibilities are shifting from the State Department to the Pentagon, and the clout and profile of the U.S. Southern Command are increasing as a result. The Foreign Assistance Act of 1961 stipulates that the State Department, not the Pentagon, sets policy and makes decisions governing military assistance programs, which are subject to a number of human rights and democracy conditions. As the Pentagon and U.S. Southern Command increasingly set the priorities for U.S.-Latin American relations, human rights and broader foreign policy considerations are likely to be sidelined. 1. The number of Latin American troops trained by the United States jumped 52% between 2002 and 2003. Note: Totals for 2000 are excluded, as U.S. government reporting for that year classified some data. According to the U.S. government's annual Foreign Military Training Report the U.S. military trained 22,855 Latin Americans in fiscal year 2003, a striking increase of 52% over 2002. Nearly all of the increase in training was the result of a doubling of trainees from Colombia. Most of these trainees were funded by counternarcotics aid programs, which since 2002 can legally be used to support counterinsurgency missions in Colombia. 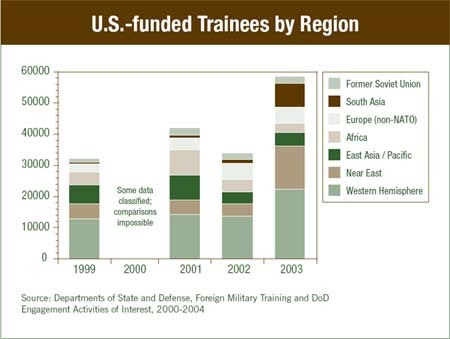 The other top recipients of training in 2003 were Bolivia (2,045 trainees), Panama (914), Peru (680), and Ecuador (662). 2. Southcom increasingly defines the U.S. role in Latin America. Compared with civilian government agencies, the U.S. Southern Command (Southcom) has a growing and disproportionate role in U.S.-Latin American relations. Between August 2002 and July 2004, Southcom Commander Gen. James Hill made 78 trips to Latin America, a record unlikely matched by any State Department official. In her 2003 book The Mission, Washington Post reporter Dana Priest claims that Southcom has more people working on Latin Americaabout 1,100than most key civilian federal agencies combined, including the Departments of State, Agriculture, Commerce and Treasury, as well as the office of the Secretary of Defense. The Southern Commands leading role in the region has important policy implications. In his annual Posture Statement testimony given before Congress in early 2004, Gen. Hill presented a list of emerging threats in Latin America that went well beyond the militarys normal purview, identifying radical populism and street gangs as major new threats facing the hemisphere. When challenged that these emerging threats deserve a civilian, not military response, Southcoms Washington liaison office replied that the commander raised these issues because he sees himself as the lead watchdog on regional developments and believes it to be his role to help policymakers identify potential problems in the region. Southcom and Defense Department personnel are now publicly describing radical populism and gangs as disturbing trends, and their focus on these issues suggests they see a role for themselves, or their uniformed colleagues in the hemisphere, in countering them. Yet social problems should not be defined as emerging military threats; doing so risks justifying a military response. Policymakers must recall the fundamental differences between a police forcea body designed to protect a population through minimal use of forceand a military, which aims to defeat an enemy through use of force. Using the wrong tool for the job, as happens when military personnel are sent into cities to fight common criminals, carries strong risks for human and civil rights. Brazil has already moved its military into anti-gang efforts, and Guatemala and Honduras have established joint military-police patrols. Instead of encouraging military assumption of policing roles, the United States should support police reform and the strengthening of civilian institutions so that they are better able to confront the internal security challenges at hand. The identification of radical populism as a threat is particularly disturbing. As policymakers currently conceive it, the term appears to be directed at political leaders and social movements that espouse economic and social policies that might make some U.S. policymakers uneasy, but which are far from threats requiring a military response. As with every other combatant commander, the war on terrorism is my number-one priority, Gen. Hill has declared. This is the lens through which Southern Command views the hemisphere, a view that is communicated to policymakers. In his 2004 Posture Statement, Gen. Hill asserted, Terrorists throughout the Southern Command area of responsibility bomb, murder, kidnap, traffic drugs, transfer arms, launder money, and smuggle humans. While that is an apt description of Colombia and its border zones, it does not apply to the rest of Latin America. Moreover, it fails to distinguish Colombias homegrown guerrilla and paramilitary organizations from Al Qaeda or other international terrorist groups that threaten the United States on its own territory. As Latin America has become a lower priority for executive-branch foreign policymakers, the U.S. military -- which has the resources, manpower and political clout to cover even relatively neglected zones -- is becoming the leading interpreter of affairs in the region. This influences policymakers elsewhere in government to perceive Latin America from a disproportionately military, threat-based perspective. In an interesting development, defense ministers from seven South American nations in September 2004 rejected the United States' vision of a major counter-terror role for the region's armed forces. The ministers -- some from countries that suffered massive human-rights abuses under cold-war military regimes -- were clearly uncomfortable with giving the armed forces such a major new internal role. According to Chilean Defense Minister Michelle Bachelet, "In our countries, the armed forces are not the first front in the fight against terrorism, but they can play supporting roles." Argentina's defense minister, José Pampuro, cited public opposition to a policing role for the military. "The vision of the United States and Canada (for the role of the military) is more one of policing or internal control. Our vision is diametrically opposed to that." 3. Little of the increase in military training and aid since 9/11 is directed towards Al Qaeda-related threats. Military aid and training programs have not changed substantially since 9/11, even though in some cases they have been repackaged as counterterrorism efforts. The overwhelming majority of military training and aid is directed to long-standing programs, rather than specific new or expanded programs to enhance homeland security or to combat the activities in Latin America of Al Qaeda and similar international terrorist groups with global reach. Counternarcotics programs regionwide and counterinsurgency programs in Colombia, nearly all of them in existence before September 11, 2001, continue to receive most funding, while decades-old military aid programs such as Foreign Military Financing grants and training through the IMET program continued a steady upward trend for the majority of countries. The Colombia program is increasingly being marketed as an antiterrorist initiative, but it had been launched as an antidrug initiative prior to 9/11. Of the 22,855 Latin Americans trained by the U.S. military in 2003, the greatest number, 5,506, took Light Infantry, which teaches such traditional basic military skills as small-unit tactics, operations in difficult terrain, and marksmanship. Some 1,650 Bolivian police took a civic action course, while 1,234 soldiers from a variety of countries learned riverine skills, applicable to both counternarcotics and counterinsurgency. Two programs specifically dedicated to antiterrorism are used in Latin America: Anti-Terrorism Assistance, a relatively small program in the foreign aid budget, and the newly created Counterterrorism Fellowship program managed and funded by the Defense Department. The vast majority of Anti-Terrorism Assistance for Latin America from FY2002-05 went to a $30 million anti-kidnapping program in Colombiaa response to a serious problem, but one not related to Al Qaeda. In FY05, $3.9 million in Anti-Terrorist Assistance for the region is again slated for Colombias anti-kidnapping program, while the remaining $1 million is aimed at the triborder area Paraguay shares with Brazil and Argentina, which reflects U.S. concerns about reported Islamic terrorist financing activities in this zone. Of the 433 people trained under the Counterterrorism Fellowship program in 2003, the overwhelming majority358 from Colombia and 55 from Peruwere from countries dealing with internal conflicts and domestic terrorism rather than international terrorist groups with global reach. In contrast, only seventeen were from Paraguay, part of the triborder area where international terrorist financing activities are suspected. Major increases in aid to one country, Mexico, are largely attributable to counter-terror efforts, particularly U.S. homeland security: enhanced border security, such as X-ray and other border security equipment; computer systems; and training for Mexican customs and immigration officials. This Northern Border Security Infrastructure program began with $25 million in the FY2002 supplemental spending bill, and received another major boost of $20 million in State Department INC funding in FY2004. Smaller quantities of port security, coast guard and airport security funding for other countries, as well as programs to track terrorist financing and money laundering, also reflect U.S. homeland security concerns. In dollar terms, however, programs that address homeland security and track terrorists with global reach represent only a small portion of the overall training and aid flows to Latin America. 4. U.S. involvement in Colombias conflict has intensified in quantity and scope. The most ambitious U.S. counterterror effort in the region is in war-torn Colombia, where in fact it more closely resembles a large-scale return to 20th-century-style counterinsurgency. This effort began in 2002-2003 with an expansion of what had previously been a counter-drug mission for U.S. aid to Colombia. In early 2003, U.S. personnel embarked on their first major non-drug initiative, a plan to help Colombias army protect an oil pipeline and re-take territory in the conflictive department of Arauca, near the Venezuelan border. In late 2003 the U.S. effort to help Colombia fight guerrilla groups took a quantum leap with the launch of Plan Patriota, an ambitious military offensive to re-take territory from the FARC guerrillas. Since January 2004, between 15,000 and 20,000 Colombian military personnel, many in mobile units recently created with U.S. advice and training, have been operating in the southern Colombian departments of Caquetá, Meta and Guaviare, a longtime FARC stronghold. Plan Patriota is the Colombian military's largest offensive since "Operation Marquetalia," a 1964 U.S.-aided offensive against communist peasant enclaves that inspired the creation of the FARC that year. While guerrillas have offered little frontal resistance to the offensive, the U.S.-supported Colombian troops are sustaining casualties from guerrilla ambushes, sniper attacks, and landmines. As the Colombian military has little experience with such long-term, large-scale operations, U.S. military and private contractor personnel are playing a key role in Plan Patriota, providing intelligence to troops in the field, helping to maintain equipment, and offering planning and logistical support -- for instance, helping the advancing Colombian troops maintain fuel and supply lines. The U.S. role in Plan Patriota has caused the military and contractor presence in Colombia to grow up against the "caps" of 400 troops and 400 contractors that Congress has mandated since 2000. As a result, the Bush Administration has lobbied hard to increase the caps to 800 troops and 600 contractors. As this publication goes to press in September 2004, a House-Senate conference committee is considering the troop cap increase as part of the 2005 Defense Authorization bill; the Senate granted the administration's request, but the House did not. 5. A New "Effective Sovereignty" Doctrine Emerges. Today, the threat to the countries of the region is not the military force of the adjacent neighbor or some invading foreign power. Today's foe is the terrorist, the narco-trafficker, the arms trafficker, the document forger, the international crime boss, and the money launderer. This threat is a weed that is planted, grown and nurtured in the fertile ground of ungoverned spaces such as coastlines, rivers and unpopulated border areas. This threat is watered and fertilized with money from drugs, illegal arms sales, and human trafficking. This threat respects neither geographical nor moral boundaries. LIGHT INFANTRY Not described in Foreign Military Training Report (FMTR). The term refers to the tactics and capabilities necessary for small units to operate in difficult terrain. MTT -- CIVIC ACTION Not described in FMTR. The term refers to the practice of military personnel providing aid or other non-security services to win the support of civilian populations. The course was offered once in 2003 to a large group of Bolivian police. RIVERINE Not described in FMTR. The term refers to skills involved with interdicting drugs or other threats on rivers. STAFF TRAINING Not described in FMTR. MET -- COUNTER-NARCOTICS BOARDING OFFICER Instruction in boarding and searching vessels believed to be smuggling drugs or other contraband. Section 1004; "DOD/DOS Non-Security Assistance"
MTT -- ENG / LOG ADMIN TRAINING COAST GUARD This course assists countries in developing an engineering and logistics support system necessary for vessels and support facilities conducting Coast Guard like missions. MTT -- SHIPBOARD FIREFIGHTING Not described in FMTR. MET -- COMBATING TERROR / DEM Not described in FMTR. JOINT COMBINED EXCHANGE TRAINING (JCET) U.S. Special Operations Forces' training with other militaries, usually in non-drug skills. MET -- CIVIL-MILITARY RELATIONS Classroom education on the military's role in a democracy. Declaring "ungoverned spaces" themselves to be threats guarantees a steady flow of U.S. military aid with the open-ended mission of maintaining a military presence in stateless areas as vast and diverse as the Amazon basin, Central America's Mosquitía, or gang-ridden city slums. The emphasis so far appears to be on improving military mobility and coverage in these areas. Tshe appropriate solution for lawless, ungoverned territory must be an extension of coverage of civilian government services, including courts, police, health clinics, schools, road-building and agricultural services, rather than a strengthened military. With declines in development aid in the Bush Administration's FY2005 aid request for the region, there is no parallel effort to help civilian institutions enter "ungoverned spaces" alongside, or instead of, the soldiers. 6. U.S. Special Forces are training civilian police in light infantry tactics. The U.S. military trained 1,855 Colombian National Police and 100 Panamanian National Police in light infantry tactics in 2003. This is the most egregious example of U.S. military training blurring the line between civilian and military roles. Light infantry tactics are appropriate military skills, not police skills, and the provision of such training encourages the militarization of police forces. Panama does not even have a military, having abolished its army -- the force behind decades of dictatorships, including that of Manuel Noriega -- with a 1994 constitutional amendment. This training is not being conducted by U.S. military police, but by U.S. Special Forces. According to the Special Forces website, the U.S. Special Operations Command "plans, directs, and executes special operations in the conduct of the war on terrorism in order to disrupt, defeat, and destroy terrorist networks that threaten the United States, its citizens and interests worldwide." The U.S. Special Forces do not have a policing mission or use policing tactics, and their role should not be replicated by Latin American police forces. In fact, training of Latin American police goes well beyond light infantry skills. Last year Bolivia's police were the number-two Latin American recipients (after Colombia) of U.S. military training -- 1,650 police and military were trained in civic action techniques. Civic Action programs generally involve entering a community to provide social services (i.e. medical assistance, school building, well digging). This again raises issues about the appropriate roles and divisions of responsibilities between military, police, and governmental service agencies. To strengthen civilian institutions, the kinds of skills taught in civic action programs should be left to health or education ministries. 7. U.S. stance on the International Criminal Court undercuts efforts to address military impunity. In 2002, Congress passed the "American Service Members Protection Act," which requires signatories to the Rome Statute establishing the International Criminal Court to sign so-called "Article 98" agreements with the United States. An Article 98 agreement is a bilateral pact wherein countries pledge not to seek the prosecution of U.S. citizens in the International Criminal Court. The 2002 law prohibits International Military Education and Training (IMET) and Foreign Military Financing (FMF) to countries that have not signed Article 98 agreements. Since the law's implementation on July 1, 2003, many Latin American countries have seen their IMET and FMF suspended: Barbados, Bolivia, Brazil, Costa Rica, Dominica, Ecuador, Paraguay, Peru, St. Vincent and the Grenadines, Trinidad and Tobago, Uruguay and Venezuela. Because counternarcotics aid, the major category of military aid for Latin America, is not cut off by the prohibition, its practical impact is limited, but it has significant political repercussions. The Bush Administration is pressuring hard for countries to sign Article 98 agreements, which, no matter how they are perceived in Washington, are seen in the region as a mechanism to ensure impunity for U.S. personnel. This undercuts any potential effort by the United States to pressure for justice in cases involving Latin American militaries. In mid-2004, for instance, the Bolivian Congress was considering a bill supporting an Article 98 agreement at the same moment it was debating a bill to prohibit trials of Bolivian officers in civilian courts. The message is clear: impunity for the military is justifiable. 8. U.S. training of Bolivian police and military is extensive in a record year for human rights abuses by the Bolivian security forces. Bolivia was the number-two recipient of U.S. military training in 2003. This occurred during a year marked by two extraordinary incidents of security force abuses. In February, during a police-military confrontation sparked by a police mutiny over low pay and tax increases, the military allegedly killed several civilians, including a nurse going to help the wounded. In September-October, the military and police response to popular protests killed at least 59 civilians. This repression only increased the protests and led to the resignation of President Gonzalo Sánchez de Lozada. In addition, U.S.-trained counternarcotics units were allegedly involved in several cases of farmers being beaten and shot. None of these cases has been adequately investigated and prosecuted, and the Bolivian military has not cooperated with civilian authorities in these cases. (Although Bolivians took a variety of courses, by far the largest number of Bolivians trained were police taking a civic action course from December 10, 2002 through February 14, 2003.) The U.S. State Department did not use the leverage created by this extensive training program to advocate for serious investigations and prosecutions of the security forces involved in these abuses, instead certifying to the U.S. Congress that the Bolivian security forces were cooperating with civilian justice authorities despite evidence to the contrary. 9. U.S. Military Training Is Increasingly Funded through the Defense Department. Two-thirds of U.S. military training for Latin America is paid for directly through the Department of Defense, as opposed to the Department of State-managed foreign aid budget, through counternarcotics accounts and Special Forces engagement programs that operate with few limits and little opportunity for public scrutiny. Traditionally, foreign military training has been funded and administered by the State Department because of the serious foreign policy implications of such assistance. The State Departments training programs are governed by the Foreign Assistance Act of 1961. Forty years of human rights and democracy conditionality, as well as requirements for reporting to Congress, applies to training paid for through State. These conditions, while limited in scope and impact, are important; they include a ban on military assistance to gross violators of human rights or to countries that have experienced military coups. In addition, the annual foreign aid appropriations bills which fund State Department activities contain specific conditions on countries with human rights problems, including Guatemala, Cuba and Colombia in the Western Hemisphere. These appropriations bills are also subject to a much stronger version of the Leahy Law, which prohibits assistance to military units known to violate human rights with impunity. Most of these restrictions do not apply to training funded directly through DOD. Perhaps more importantly, the Armed Services Committees in Congress, which oversee the Defense Department-funded programs, provide little scrutiny of programs from a human rights perspective. The Foreign Operations Appropriations Subcommittees and the Foreign Affairs Committees provide more substantial oversight of the foreign policy and human rights implications of training programs. Moreover, the Armed Services Committees are traditionally unreceptive to new or strengthened conditions and restrictions. 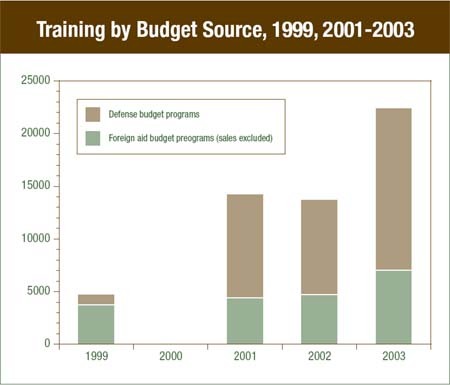 When available, training numbers for 2004 will likely show that the current trend to fund Latin America training through DOD, combined with prohibitions on FMF and IMET to countries that have not signed Article 98 agreements, will result in an even higher percentage of training going directly through DOD and by-passing human rights protections in foreign aid law. Increased aid and training through DOD risks making these protections irrelevant. 10. Enduring Friendship: U.S. Advocates Formation of a Latin American Navy. Bush administration defense officials have been developing a proposal, Enduring Friendship, to create a multinational operational maritime force of the Americas, a flotilla of vessels led by the United States. This idea, often referred to as a Latin American Navy, was seen as a way to fill the security and drug interdiction gap created when U.S. naval assets were redeployed from the region to defend the U.S. coastline after 9/11. The stated goal of Enduring Friendship is to create an operational force to respond to transnational threats on the high seas, such as drug and weapons trafficking, terrorism, uncontrolled migration, fish poaching and other threats to marine life, hazards to navigation, and humanitarian emergencies. The U.S. government sees current multilateral exercises within the region, such as the Panamax canal defense exercise with Argentina, Chile, Colombia, the Dominican Republic, Honduras, Panama, and Peru, as a precursor to Enduring Friendship, establishing the kind of coordination needed to make this effort function. This proposal, which has not been viewed favorably by Latin American militaries, should generate considerable debate, as it potentially would place civilian policing activities, such as those governing fishing and migration, under military jurisdiction. 11. U.S. military aid nearly equals economic aid to the region. 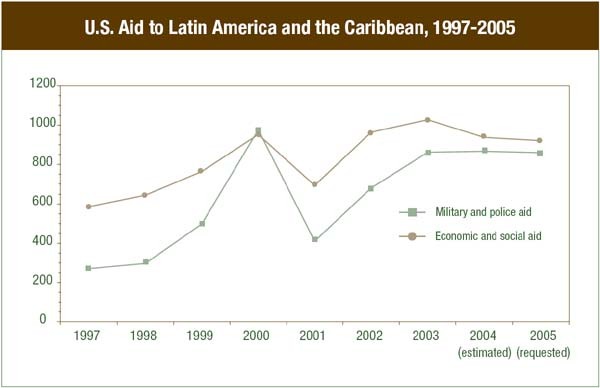 In FY05, U.S. military aid nearly equals economic aid to Latin America and the Caribbean. The United States is slated to provide $921.07 million in economic aid and at least $859.69 million in military aid. Indeed, the major economic and humanitarian aid programs, Development Assistance (DA) and Child Survival and Health (CSH), are reduced by 10% and 12%, respectively, from their FY04 levels in the Bush Administrations 2005 plan. This continues a trend that accelerated in 2000 with the Clinton Administrations introduction of Plan Colombia, an overwhelmingly military aid package that has been renewed each year as a regional Andean Counterdrug Initiative (ACI). In 1997, by comparison, economic aid was more than double military aid to the region. During the Cold War, the ratio was even higher. The Bush Administration's two major new non-military aid programs, the "Millennium Challenge" account and HIV/AIDS initiative, are likely to provide little additional funding to Latin America and the Caribbean. Only Bolivia, Honduras and Nicaragua were deemed eligible to apply in 2004 for inclusion in the Millennium Challenge, and it is likely that only one, or none, will make the final cut. The President's HIV/AIDS initiative is limited to a handful of countries, of which only two, Haiti and Guyana, are in this hemisphere. The increasing concentration of U.S. assistance on military rather than development and humanitarian aid reinforces the image of the United States as preoccupied primarily with its own security rather than being sufficiently invested in the welfare of the region's population. Our security, however, is inseparably tied to democracy and prosperity in the Western Hemisphere; a greater emphasis on nonmilitary priorities is urgently needed. All numbers in millions of U.S. dollars. Written by Adam Isacson, Joy Olson and Lisa Haugaard. © 2004 LAWGEF, CIP and WOLA. Any material herein may be quoted without permission with credit provided to the three organizations. Thanks to the Open Society Institute Development Foundation and the Compton Foundation for their generous support of this project. Michelle Wisecaver, with a grant from University of California's Institute on Global Conflict and Cooperation, provided research assistance on the military database. 1 United States, Department of Defense, Department of State, Foreign Military Training and DoD Engagement Activities of Interest in Fiscal Years 2003 and 2004: A Report to Congress (Washington: June 2004) http://state.gov/t/pm/rls/rpt/fmtrpt/2004. 2 General Hill, Speech at the World City Breakfast, Miami, Florida, 6/30/04. 3 Dana Priest, The Mission: Waging War and Keeping Peace with America's Military (New York: Norton, 2003), p. 74. 5 Response by U.S. Southern Command to Joy Olson, Washington Office on Latin America, April 20, 2004. 6 Gen. James Hill, U.S. Southern Command, "Colombia -- The Way Ahead: Speech before the Center for Strategic and International Studies" (Washington: Sept. 10, 2003) http://usinfo.state.gov/xarchives/display.html?p=washfile-english&y=2003&m=September&x=20030910134137rellims0.3454096&t=usinfo/wf-latest.html. 7 General James T. Hill, United States Army Commander, United States Southern Command Testimony Before House Armed Services Committee, U.S. House of Representatives, March 24, 2004. 8 Debora Rey, " South Americans reject terror plan/Nations worry U.S.-styled force could give military too much power," The Houston Chronicle, 14 September 2004. 9 United States, Department of Defense, Department of State, Foreign Military Training and DoD Engagement Activities of Interest in Fiscal Years 2003 and 2004: A Report to Congress (Washington: June 2004) http://state.gov/t/pm/rls/rpt/fmtrpt/2004. 10 Connie Veillette, Clare Ribando, and Mark Sullivan, U.S. Foreign Assistance to Latin America and the Caribbean, Congressional Research Service, July 22, 2004), p. 21. 11 United States, Department of Defense, Department of State, Foreign Military Training and DoD Engagement Activities of Interest in Fiscal Years 2003 and 2004: A Report to Congress (Washington: June 2004) http://state.gov/t/pm/rls/rpt/fmtrpt/2004. 12 Bureau for International Narcotics and Law Enforcement Affairs, International Narcotics and Law Enforcement: FY2004 Budget Justification, June 2003 http://www.state.gov/g/inl/rls/rpt/cbj/fy2004/21882.htm. 13 Remarks by Gen. James Hill, Commander of the U.S. Southern Command (Miami: North-South Center, March 3, 2003), http://www.ciponline.org/colombia/03030301.htm. 14 United States, Department of Defense, Department of State, Foreign Military Training and DoD Engagement Activities of Interest in Fiscal Years 2003 and 2004: A Report to Congress (Washington: June 2004) http://state.gov/t/pm/rls/rpt/fmtrpt/2004. 16 United States, Department of Defense, Department of State, Foreign Military Training and DoD Engagement Activities of Interest in Fiscal Years 2003 and 2004: A Report to Congress (Washington: June 2004) http://state.gov/t/pm/rls/rpt/fmtrpt/2004.